Oh look, I know I'm a CDLM junkie, but seriously, this is the first thing since my Chanel Trio, which in turn was the first thing since my very first introduction to (Crème de) La Mer, all those year ago, that really made a huge, noticeable, tangible difference to my skin. 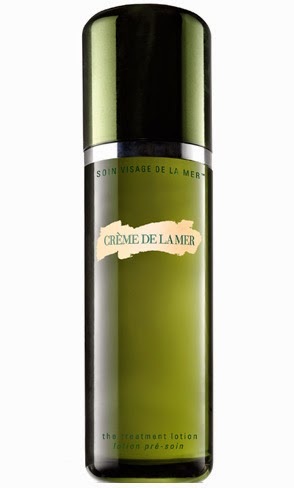 The (relatively) new Crème de la Mer Treatment Lotion is one of those rare things in skincare; it does what it says. Ok, you can ignore the bumpf on the CDLM site about it being a "miraculous source of vitality" or that it's like "liquid energy". How and ever, a drop-and-a-bit of this each day really helps. How so? First off, it smells gorgeous, waking my skin up gently, and preparing it for the serum and moisturiser to come after - however it does it, I'm using very slightly less of those products after application of this lotion, and I'm finding that either this product, or a combination of this product and the products after it, are doing better things for my skin than before; at a time when I really need CDLM, when the central heating and the cold weather are making my skin sore, stretched and dessicated, this stuff is making my tired and battered skin glow, and look and feel healthier. To use it, you're supposed to just apply with fingertips - that's what I do - a drop-and-a-half will do nicely. You can alternatively "saturate a cotton pad and press into skin", if you feel like wasting the stuff. After that, follow up with your usual skincare regime. For me, at this time of year, that's The Brightening Essence, followed by a serum (I'm using up a few at the moment), then The (CDLM) Moisturiser, night and day, and it's working just fine. Fast forward a couple of months to see if I still need this stuff or not (I usually switch over to the Chanel Trio come summer time, when my skin is more oily)... I'll have to report back. It's ok to use under any of your CDLM products - I use it under my masks as well to help draw the mask into the skin better. And I know there are pedants out there who will argue that this can't be happening, but I'm telling you, personal empirical evidence suggests otherwise. This stuff has replaced the previous (now discontinued) Radiant and Hydrating Infusions; I was demented when I found out these were going, but honestly this stuff beats them both, hands down. It's somehow silkier, lighter, less sticky than the Infusions. While I had been going to see if I could get my paws on the Radiant Infusion (while I still could) on counter, I decided to get this after using a sample size of it instead. Way better. Way, way better. On its own, it doesn't give you plumper, less lined, healthier, more glowing skin. But combined, it demonstrably increases the efficacy of the products used after it. Cost is around the €115 mark for a 150ml bottle (around €98 at the airport); I know this is expensive, but I'm going on using it for three months now and I've used approx 1mm down from the top. While this might hardly be a terribly scientific way of measuring it, that's basically feck-all. I anticipate this bottle lasting me a long time. I've had a couple of CDLM facials recently (incidentally, they're usually run at your CDLM counter the last week of the month and cost between €60 - €70, redeemable against purchase, for a mini 30-minute facial) and the beauticians have all said the same thing: that this is the biggest seller of all their products in years; I can see why.